I have found this ads when I am doing research for my client. 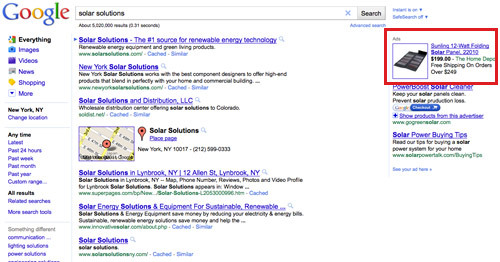 This is interesting that Google shows the images ads next to Text ads. See the screenshots here. This Home Depot ad linked directly to branded-site. This will be impacted on CTR, current image ads now mostly place at Content Network, but once this happens on Search Network, I just wonder how much of this CTR, Any thought? Update : This ads feature is part of Product Ads Extension (New Product from Google Adwords which now available only US Advertisers.